We have not yet determined when "the good old days” actually were, but by the end of this post I believe there will be no argument that any answer to the closely-related question “when did things begin to go wrong?” must be found long before 1975. Both the specific “things” and the specific dates will vary location by location, but they were everywhere by the 1970s. The numbers from the federal Census offer the most fundamental evidence that this was so. Each of the eight towns along the Schuylkill River between Philadelphia and Reading demonstrated constant population growth between the arrival of the railroad in their town in the 19th century and the middle of the 20th century. This means that labor was in demand in the new factories or the expanding old ones, attracting new residents. This labor had to walk to work, so the densely populated, urban-structured boroughs steadily sprouted new buildings. These were truly “The Good Old Days,” a period of growth, prosperity and community. Favorable locations at the intersection of railroads and local roads lay at the base of this prosperity, because this attracted the industries. The larger boroughs augmented their industrial prosperity by developing a commercial sector that serviced both the local inhabitants and those in a trading area around it, utilizing both local roads and “light rail” (trolleys). Then things began to change. If a net rise in population indicates prosperity, then a net decline suggests the opposite. West Conshohocken’s population peaked with the 1930 Census. Conshohocken’s population peaked in 1950, that of Pottstown and Norristown in 1960, and that of both Bridgeport and Spring City in 1970. Their populations began to decline in the years afterward. The period between the 1970 and 1980 Censuses saw this decline become close to universal. Even Phoenixville, which has demonstrated an overall population rise through the 2010 Census, lost population between 1970 and 1980. 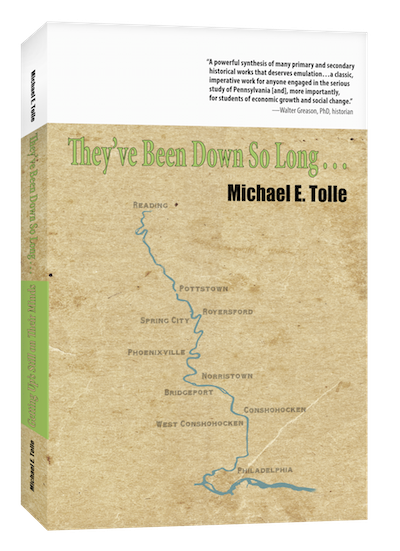 In fact, of the eight towns in the Schuylkill valley between Philadelphia and Reading, seven lost population between 1970 and 1980. Royersford, the exception, recorded a net gain of eight people. Let's also not forget that during this decade Conshohocken and Royersford gutted their downtowns via Urban Renewal, with Pottstown not far behind. In Norristown, various forms of private enterprise accomplished essentially the same result. The disturbing trend of declining population was not confined to the Schuylkill valley by any means. Lansdale, the area’s third largest borough, also steadily lost population after 1970. The Census offers only the most basic guide to what was happening. It population designation is a net number; it does not reveal how many left, or how many arrived, only the numerical difference between them. It also does not indicate what kind of people left, why they left, what kind of people arrived, or why they arrived. Once past the numbers themselves, this is the real story. It is also a very misunderstood story. I will deal with this story, about the economic and the social forces that had become pervasive by 1970 (at least in their local context), in future posts. Even the basic numbers demonstrate that things had begun to “go wrong” long before 1975. That year is actually late on our timeline, because it more correctly marks the time by when several local government were taking truly radical actions that had nothing to do with subsidized housing (agreeing to raze the core of one’s downtown counts as “radical”). If there is one thing we can ALL agree on, it’s that by the time local government takes anything resembling radical action, the problem is already well established and everyone knows about it. The post-1975 Federal program known as “Section 8,” which has survived as “subsidized housing,” was designed as a response to the combined economic and social forces that had been sweeping the United States since shortly after the Second World War. It deserves a place in any discussion of the problems afflicting America’s urban areas after 1975, but not the fundamental one that so many ascribe to it, because so much had gone wrong before 1975. The “good old days” were long gone by the time Section 8 appeared on the scene. --Subsidized housing is a SYMPTOM of a town’s decline; its arrival was a sign that decline was already well under way. --Subsidized housing may itself contribute to further decline; the question is how much. P.S. This is not the last you will hear from me about subsidized housing. I promise. It’s part of the story, but a part that needs to be understood in its proper context. So let’s lay the myth of SUBSIDIZED HOUSING to rest. We will return later to the subject of subsidized housing, assessing its rightful place in local history. If “things began to go wrong” before 1975, “subsidized housing” had very little to do with it. As I also noted last time, my book What Killed Downtown? 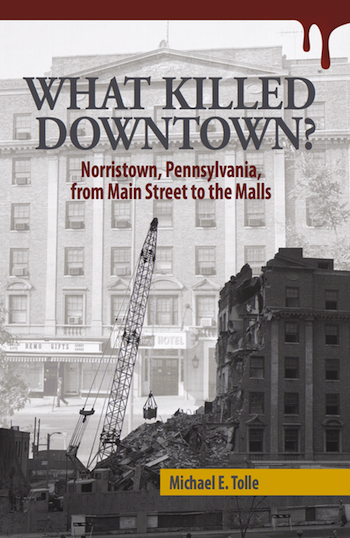 Norristown, Pennsylvania, From Main Street to the Malls pronounces downtown Norristown “dead” by that date. Surely the collapse of the region’s largest center of retail commerce and services constitutes something going (very, very) wrong in Norristown. Two conclusions must follow: (1) Norristown’s decline began before Section 8 ever saw the light of day, and (2) we must examine—and give serious weight to—other possible causes of Norristown’s decline. 1975 is certainly a significant dividing line date for Norristown, but what about the others in the Schuylkill Valley? Can we extend the 1975 dividing line to other communities despite their individual differences? For now, let’s shift our gaze both up and down the Schuylkill, to the other “river boroughs” (yes, I know that Norristown is no longer a borough). There is considerable evidence that suggests yes, 1975 is important to other communities. Consider Conshohocken: the differences between it and Norristown are considerable, and size is only one of them. Yet the much tinier Conshohocken also had a downtown, smaller but relatively as bustling and vibrant to the local community. The record shows that the deterioration of its downtown had reached such a point by 1965 that the Conshohocken Planning Commission asked the Montgomery County Planning Commission to develop an urban renewal plan. In 1974 the borough received a multi-million Urban Renewal Grant and proceeded to bulldoze the 25 core acres of downtown, leveling buildings and evicting residents in the process. We should consider this evidence that things had started to go wrong before the arrival of Section 8. Even a superficial look at Conshohocken’s history suggests that the decline of Alan Wood Steel and Lee Tire, and the jobs they offered, might lie behind downtown’s demise. In the case of Conshohocken, therefore, we are looking at economic, not social reasons behind the beginning of the borough’s decline. Does that make sense to you, veterans of Conshohocken? In thinking about this, don’t rule out the possibility that after 1975 subsidized housing played a major part in the borough’s continued decline, just try to place it in perspective. And what about Pottstown? It is closer to Norristown in size than to Conshohocken, or any other river borough, for that matter. It developed a commercial downtown second only to Norristown among Montgomery County river boroughs, one that was the hub of its own region. Pottstown was, however, an industrial town, and thus more like Conshohocken, although not as tied to one or two major companies. Still, the nationwide decline in our steel and automobile industries lies behind the declining fortunes of both, and those boroughs in between. 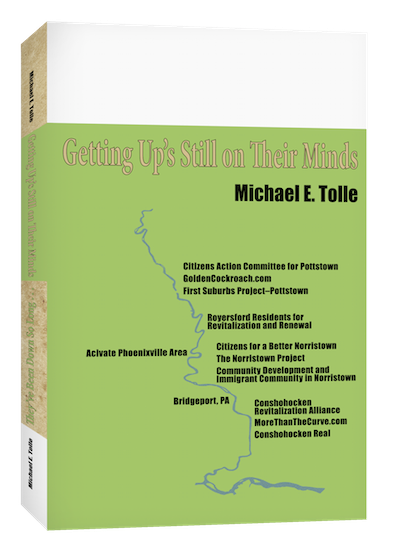 Pottstown did not engage in urban renewal to the extent that Conshohocken did, but the responses of both boroughs were more similar than that of Norristown, which repeatedly rejected the lure of government money during the time we are discussing (much to the dismay of its own planning commission, of course). Pottstown has also experienced more population diversity than Conshohocken, and “subsidized housing” continues to be a hot topic there. Those who remember Pottstown may simply have more (bad) options to choose from. There are many variables at play here. Still, regardless of the specific date of this or of that, what we are searching for here is what people—that means you—believe to be the most important thing that happened, and when. But what if you can’t decide on just one thing? If you can’t, that may be because all the options you are considering actually qualify; there may be more than one event or trend, and they might be quite different, but each important in its own way. That is why the When remains our focus for now. It doesn’t mean we are done with subsidized housing as a suspect in our investigation. Far from it. So what say you veteran residents, advocates, those who moved out of either Conshohocken or Pottstown, or for that matter, any of the boroughs in between? When did things “start to go wrong” in your town? Was it before—or after—1975? Remember, we said start to go wrong. There doesn’t have to be only one thing, or even one thing at a time. Tell me what they are, and we will get to them in this blog.